We’d love your help. 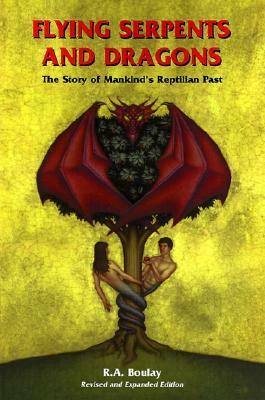 Let us know what’s wrong with this preview of Flying Serpents and Dragons by R.A. Boulay. To ask other readers questions about Flying Serpents and Dragons, please sign up. i love his book i found this reaserch out in the field of both the bks to be striking. I pity those reviewers above, and people like them, who ridicule authors like R.A.Boulay and other proponents of similar Ancient Astronaut theories, simply for putting forth so many interesting questions (because that's really what he openly admits he does, often throughout this work) in light of fascinating and thought-provoking references and evidence which are all from copious sources. Some people will perhaps only read the cover and introduction and dismiss it as soon as any little bit of inf I pity those reviewers above, and people like them, who ridicule authors like R.A.Boulay and other proponents of similar Ancient Astronaut theories, simply for putting forth so many interesting questions (because that's really what he openly admits he does, often throughout this work) in light of fascinating and thought-provoking references and evidence which are all from copious sources. On a positive note - I found this book to be a very interesting gathering of information and collection of obscure and remote antiquated information, i.e. biblical, mythological, sacred texts and otherwise, that we were not exactly taught in bible school, or any other public school for that matter. And I am of the school of thought that that has been so for intentional purposes - to keep us from bigger truths. The author clearly cites all of his fascinating sources and cross-references them rather plausibly so as to shed new light on even the more popular accounts in scripture and even proposing a whole new interpretations that make the long-standing scholarly (so-called)interpretations seem vague and incomplete at best. The information is also organized in a sequential order that piques ones interest even as he jumps from one chapter of information to the next. The information, although eclectic as it spans from different cultures and time periods, interestingly ties together in several respects and it is this synchronicity that makes the information all the more remarkable. Interesting theories.. I loved all the biblical references. Great read with some nice symbolic illustrations. For anyone interested in piercing the self imposed veil of dogma and religion, spiritually inclined or scientifically inclined, this is a must read for all and shoukd be mandatory in last 2 years of senior schools. Bit thin on the conclusion though: why not explore concept of hyperdimensions within holographic universe? Wow. What planet is this guy from?